Wildflower Wax Candle Studio: Sorry...These Capezio's are all mine! A little selfish maybe! I have been looking for a pair of these Vintage 70's Capezio's with the turquoise butterfly's for a year now in my size. They finally arrived the day before we went to Atlanta. Not great for walking in all day long through market. 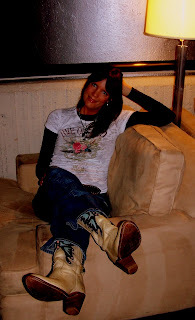 I did have to take them off and walk barefoot...that's okay, I looked liked a redneck, they still look cool! We have over 70 pair of boots in stock this week, this would be a good time to check some out. I couldn't fit them all in a picture, but here are a few..... Size 61/2 Luchesse, like new, hardly worn, comfortable, gorgeous! Size 9 , black with red inlays,vintage Dingo, fit like an 8, great heel. We are pouring tons of new fall candle scents that are truly amazing. I'll be posting some pics soon! LOVE those Size 61/2 Luchesse. Yes-I can fit tinto those. Will have to come and check em out!